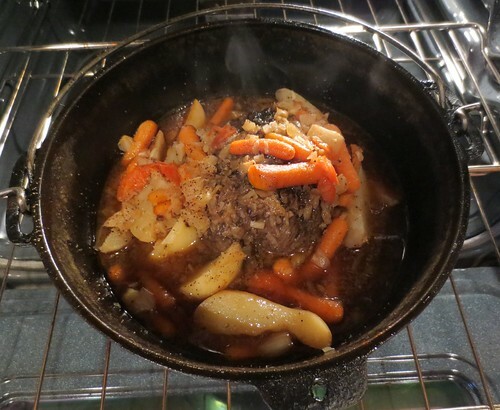 Roasting a pot roast meal in a Dutch Oven is so easy and good tasting. 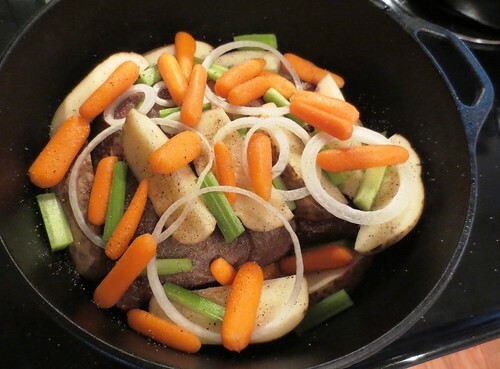 So when it comes to the proverbial question, “What’s for dinner?” You can say a wonderful pot roast meal. Not only is it great tasting but super easy to put together. 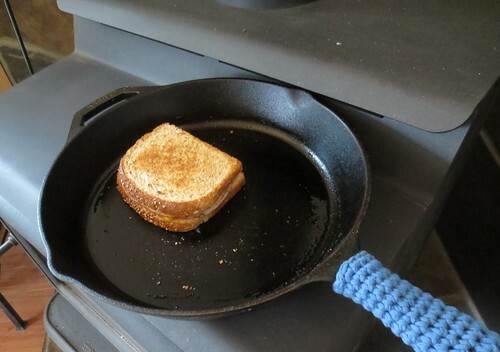 Once you start cooking with cast iron, you will love the results and easy cast iron care steps. Just place a 3-4 pound beef roast in the Dutch Oven. 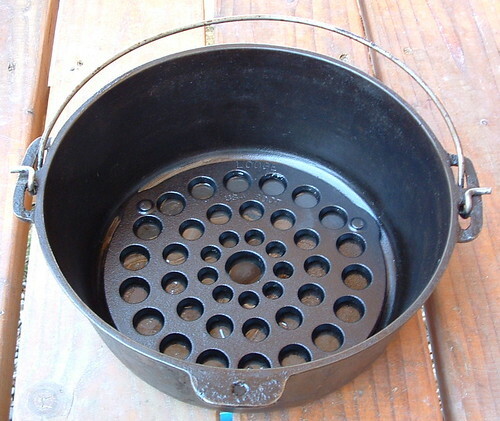 I like to use a cast iron trivet in the bottom to keep the meat up from the bottom but it’s not necessary if you don’t have one. Season the meat with all goodies you like on it such as seasoning salt, pepper, onion, garlic, sage, few dashes of Worcestershire sauce, and some beef broth. I like to put all the ingredients in a large measuring cup and mix it all up and pour it over the meat and veggies. Next add the potatoes, some slices of onion and other veggies. I used carrots and some sliced celery too. Again I like to pour the seasoning and broth over the meat and veggies before baking. I had a 3 pound Elk shoulder roast given to me and set out to roast it in my cast iron Dutch Oven. I had never done a Elk roast before so I did a little research and got some advice from a few people who had experience in cooking Elk roasts. Because Elk is very lean, it is a good method to slow cook a roast to get tender and moist meat. 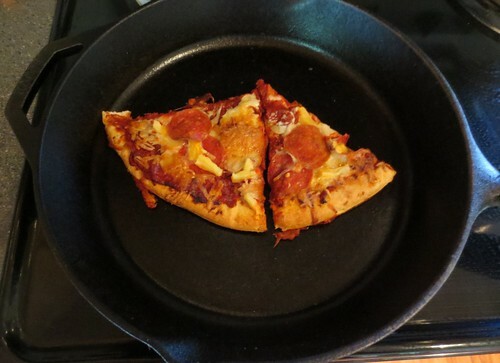 I have used cast iron for cooking for years. The secret of using cast iron pans and dutch ovens is how you care for the pots before and after use. The first most important thing before use is the proper seasoning. If the pot or pan isn’t seasoned thoroughly you will find cooking in it is miserable. Everything sticks in it, it looks rusty, and doesn’t smell good. If you have any of these issues, your pan isn’t seasoned properly but take heart. 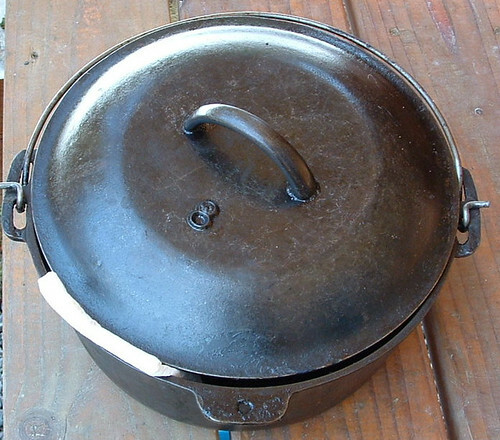 Even the worse cast iron pots and pans can be corrected with the proper seasoning. 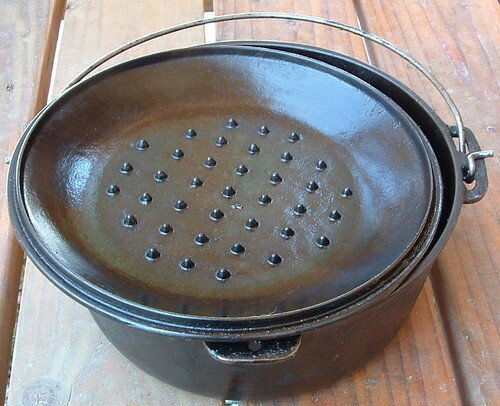 Let’s take a rusty dutch oven that I recently obtained for example. It had rust spots on the outside and the inside. It had a rough and dried-out look about it on the inside too. But I knew with proper care, I could restore this pot to good usable condition. I didn’t take any pictures of the dutch oven before I worked on it but just let me say it was in need of some serious TLC. Here is the inside lid after I applied oil to the inside and outside and put it in the oven to season it up. 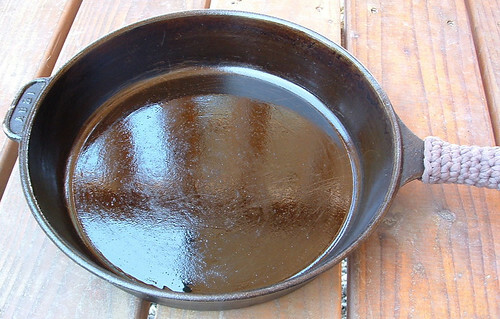 Steps to Seasoning your Cast Iron: Wipe with cooking oil, I like to use Olive oil, on the inside and the outside. If you have a dutch oven that is in bad condition, place it on a cooking sheet inside your oven at about 300-350 degrees. I left mine for a half hour before checking. Check the progress and turn the lid if necessary. Make sure its getting hot enough for the oil to be absorbed into the cast iron. Add more oil if needed so it has a generous amount of oil on the cast iron. Let it bake for another 30 minutes so it has baked for a full hour. Re-apply more oil to the inside and outside. Wipe the oil around with a paper towel. I always leave a little excess oil inside the pan so it can adsorb even more. An important tip: Never use soap on your cast iron. Rinse out the pan in the sink and scrape out any food. 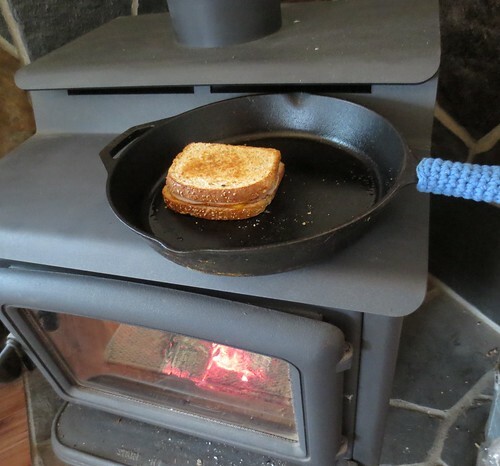 Boil water in the pan and use a nylon scrubber to get any hard stuck stuff off of your cast iron. I also reminded that the Boy Scouts use dirt or sand to scrub out their cast irons pans when they are camping. Then they boil water in the pans before adding some oil to season the pot for the next use. Here is my favorite large cast iron fry pan. It is all seasoned after the last time I used it. I don’t know if the picture shows it well enough but this pan has a wonderful seasoned finish to it. When I cook in this pan, it’s almost like using a non-stick pan. Once a pan has a good seasoned surface like the cast iron skillet above, you can just rinse it out in the sink after use. Boil water in it if necessary on the stove to get it clean. Once it is clean, I pour some cooking oil into the pan and put it on the burner on medium until the oil heats up good. Wipe the oil around with a paper towel making sure you get the inside of the pan well oiled. Leave it on the burner for another few minutes. I usually turned the burner off and just let it cool down and finalize the seasoning process at this point. A final note here is my dutch oven stored. You don’t want the lid left on tight but leave a gap so it can breathe. I put a folded paper towel inside the lip to keep the lid open with a gap between the pot.